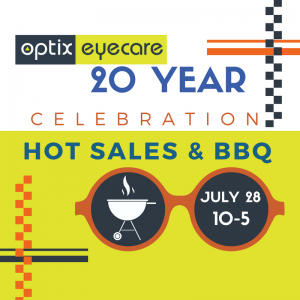 Optix Eye Care is proudly celebrating their 20th year in Weaverville with a HUGE SALE & BBQ Saturday July 28th from 10 am – 5 pm! ALL EYEWEAR WILL BE ON SALE! A chance to WIN a pair of Kaenon sunglasses. Have some Southern Smoke BBQ on us! View the entire State Optical collection all hand made in Chicago! 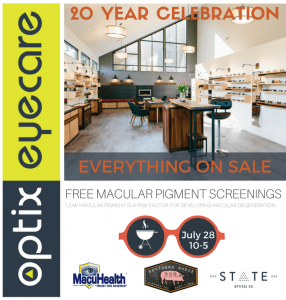 We hope you can make it out to find that perfect pair of glasses at an incredible price while enjoying some tasty BBQ and some extra special event opportunities! 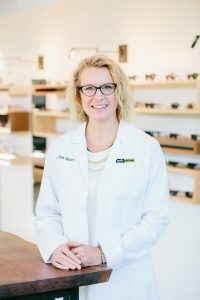 Dr. Kim Walters earned her Doctor of Optometry degree from the University of Alabama at Birmingham School of Optometry. Dr. Walters served two externships, one with Carolina Ophthalmology and one at Aldridge Eye Institute. She also practiced one day a week at Mission Hospital’s Low Vision Center for seven years.